Lingering motion sickness is one of the occupational hazards of working at sea off the coast of Japan for three weeks. 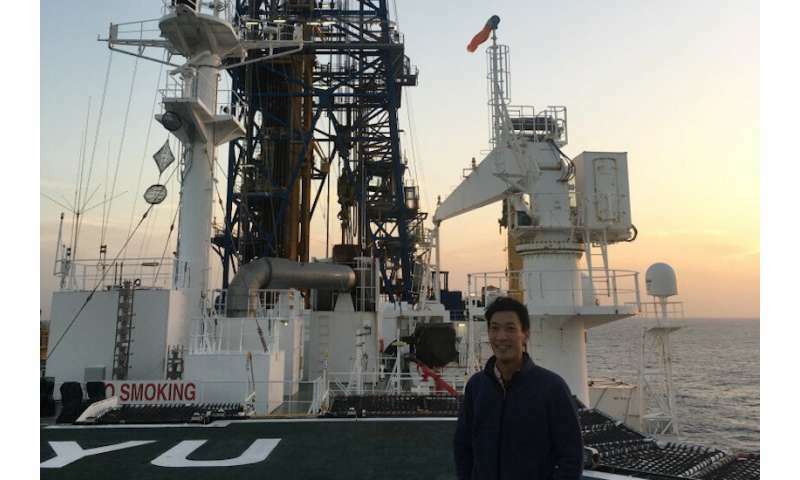 Hiroki Sone can attest to that, having spent part of the fall 2018 semester on the deepest scientific oceanic drilling project ever. "Maybe I shouldn't nod too much," says the assistant professor of civil and environmental engineering at the University of Wisconsin-Madison, a day after returning stateside. "I'm feeling dizzy." Sone and Ph.D. student Zirou Jin are part of the international team of scientists working on the Nankai Trough Seismogenic Zone Experiment. In the final phase of the 11-year experiment, researchers are drilling below the Nankai Trough, the meeting point of the Eurasian and Philippine Sea tectonic plates and the source of repeated earthquakes. If successful, it would be the first time scientists have reached a depth at which earthquakes spawn in a subduction zone, where one plate (in this case, the Philippine Sea) pushes under another. The drilling, which reached a record depth in early December 2018 and will continue until March 2019, will yield rock samples and allow the team to install sensors, potentially unearthing new clues about the processes that drive earthquakes. "We want to understand what kind of forces are accumulating in this plate boundary, because that's the driving force for ground motion during earthquakes," says Sone. "To be directly in there and see the material really improves our understanding of what is actually happening." Sone grew up in a Japanese society that's understandably wary of earthquakes, given the long history of seismic activity in the country. He remembers elementary school visits from a truck with a shaking room that enabled students to practice safety maneuvers. He was a graduate student at Kyoto University working on a thesis about a deadly earthquake in Taiwan when he heard about plans for the first NanTroSEIZE Integrated Ocean Drilling Program expedition, which launched in 2007. Six years later, he joined his first expedition on the Nankai Trough. This time, he's leading the group's physical properties team. When cuttings—the rock debris generated during drilling—come to the surface, Sone's team examines their densities to calculate changes in porosity, the percentage of empty space in the rock that's filled by water. Porosity typically decreases with depth, but the researchers look for exceptions to that trend that will indicate higher-than-expected fluid pressure. Scientists have long postulated that fluid pressure along tectonic plate interfaces is abnormally high, which could encourage a plate to slip like a puck on an air hockey table. But no one has measured that fluid pressure at this depth, Sone says. "This is a good opportunity to test those hypotheses and validate theories or maybe disprove some of them," he says. Sone will helicopter back onto the drilling vessel Chikyu, whose name means earth in Japanese, again in January 2019, while Jin will work a pair of two-week shifts in February and March. Work days are long aboard the Chikyu, with 12-hour shifts and limited internet access. But the promise of rock core samples—much larger and more useful than cuttings—at the end is a powerful motivator. Jin is studying cores from a previous expedition for her Ph.D. work on the viscoplastic properties—how materials flow and deform over time—in Nankai Trough's accretionary prism, the collection of rocks and sediment formed during plate subduction. "We try to see how the stress accumulates," she says. By taking cores from the plate interface and slowly deforming them in the lab, Sone says, scientists can better understand the forces building up during the 100 to 400 years between the earthquakes that generate tsunamis in the Nankai Trough. "It's important to understand how the earth ruptures during these large earthquakes that happen in a matter of minutes, and scientists have focused on that for many decades," he says. "But what happens in between the 100 years? How does the force accumulate to get ready for the next earthquake? That is an equally, if not more, important questions to ask that we have not addressed in the community. We'd like to make a breakthrough there to better forecast seismic hazards around the world."